An efficient storage solution is integral to a successful virtual desktop infrastructure (VDI) implementation. 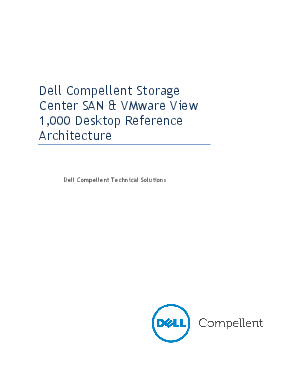 With a Fluid Data architecture and integrated software features such as Automated Tiered Storage, Thin Provisioning, Continuous Snapshots and Remote Replication, the Dell Compellent Storage Center SAN proves to be a highly effective storage option for VMware View. Dell Compellent Thin Provisioning software separates storage allocation from utilization. While administrators can create storage volumes of any size for virtualized applications, physical capacity is consumed only when data is written to the disk. With Thin Provisioning, IT groups can avoid having to purchase excess capacity up front. When an application requires more storage, the system provisions more from the pool of unused capacity. For instance, Thin Provisioning can present 10 virtual storage volumes, 1TB each, for use by 10 unique virtual machines (VMs), but only require the physical capacity that is actually written for each VM.